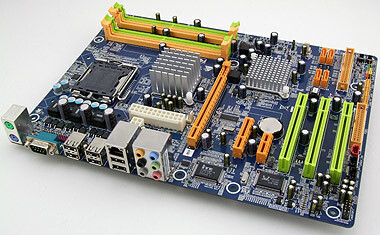 Abstract: Biostar's TP35D2-A7 motherboard is built with Intel's P35 Express and ICH9 chipsets, so with a Core 2 Duo or Core 2 Quad processor it becomes the backbone for a good WindowsXP or Vista PC. Overclocking is alive and well! PCSTATS has all the details you need to see at a glance to know which board is best. The chart we've compiled below lists the highest overclocked Front Side Bus speeds we were able to achieve while maintaining 100% stability. Typical Test System Specifications: Intel Core 2 Duo E6600 (2.4 GHz), 2GB Corsair Twin2X2048-8888C4DF DDR2 Memory, MSI NX7800GTX-T2D256E. Please see individual review for more specific test details. * - Tested with Intel Core 2 Duo E6750 (2.67 GHz) and 2GB Corsair Twin3X2048-1800C7D DDR3 memory. For a mainstream motherboard, the Biostar TP35D2-A7 motherboard overclocks pretty darn well. Reaching 483 MHz FSB puts it within the top five fastest motherboards PCSTATS has tested thus far! The Intel P35 Express and ICH9 chipset combo is well known for its stability and performance, and now low cost motherboards using are available. The Biostar TP35D2-A7 motherboard is affordable, and well paced - both excellent qualities for a computer part. With a retail price of $108 CDN ($111 US, £54 GBP), the Biostar TP35D2-A7 motherboard only the bare basics; Gigabit networking, 7.1 channel audio, a sprinkling of SATA and one IDE channel. There is ample room for expansion though. The TP35D2-A7 is as plain jane as it gets, but its passively cooled heatsinks run silently, and the majority of ports and connectors a typical office PC require all all there - save for that pesky parallel printer port. We'd advise maintaining good airflow in the PC case, the chipset heatsinks are compact and if overclocked the chipsets might sweat it out. Where the Biostar TP35D2-A7 really excelled was in the benchmark testing. For a part that costs just over $100 CDN, this motherboard is a real monster. This board kept up with motherboards two to three times as expensive in SYSMark 2004 to PC WorldBench 5.0 and Super Pi. Just goes to show you that an affordable boards stocked with excellent high speed memory and a overclocking friendly Intel Core 2 Duo E6750 can make a winning combination. Gaming results are particularly nice.